For the first time I can remember, maybe ever, I was both confident and relaxed going into a race. They say the second night before a race is the most important night and to get a full night's rest and while I might argue that it should start about a week out, more, quality, sleep is better than none. Thursday night resulted in a quite crappy sleep with me waking up every few hours. But Friday night, I went to bed a little early and slept soundly with none of the pre-race jitters that usually keep you awake starting at 2am. I'd set my alarm early enough to ensure I got to the race right as transition opened, only was a tad late and as a result didn't get the money transition spot. I did, however, still get a really decent one and set up my stuff. We were told four-to-a-rack, but that left lots of space and I knew from experience that late arrivals would move other, non-present athlete's stuff over to make room for theirs. Even knowing this, I took my bike out for a warmup ride since I'd never ridden the course before and couldn't drive it beforehand. It was only a 12.5-mile loop and I had plenty of time. We had our own lane coming out of Union Reservoir and for the next several miles marked with cones. But when the road turned right, the cones stopped and I realized I didn't have directions or know the streets so I just winged it. Turns out, I guessed right and did manage to ride the entire loop. As I'd suspected earlier, coming back to my rack, someone else had racked there bike where mine would have gone. Thankfully, he was still there and I had him move his stuff over. I finished setting up and started putting on my wetsuit. We still had ample time before starting, but I wanted to make sure I was acclimated to the water. Or, at least as much as possible given the 54º temperature. The water was cold and I got in as much of a warmup as I could manage - I didn’t want to start cramping. We line up to start and I take a left of center position up front. The horn sounds and we’re off. I go out hard and strong and eventually someone catches me and passes but he’s going too fast for me to be able to hang on. I did most of the swim on my own, without drafting, which stinks, but sometimes is the nature of the beast. About 300-400m in my chest tightened up and I forced myself to relax and backed off. One of my points of emphasis this year is swimming less in training, and not working so hard on the swim in racing. Was it a good strategy, I don’t know, but I was 3rd in my AG on the swim. T1 was a smooth transition with no issues. Due to the run over the muddy and grassy berm from the parking lot to the dirt road I chose not leave my cycling shoes clipped in to my pedals but I did when dismounting after the bike so in retrospect, I should have just left them clipped. The bike was uneventful. Only two riders passed me during the entire loop and neither were in my age group. I passed a ton of riders, but I stopped looking at age groups on people’s calves and just rode my race. T2 was even smoother leaving my shoes clipped in to my pedals, but the problem was that due to the cold water and probably the airflow on the ride, my feet were completely numb - exactly like last year. I ran on stumps to my rack, dumped my helmet, pulled on my shoes, grabbed my race number and was off. I tried to keep a high turn over on the run and was initially successful, but eventually slowed down. I don’t recall when I started feeling my feet again, but it was well after mile two. The out-and-back course was flat, having just been grated, but sported some rough spots with decently sized rocks churned up by the blade. There was also a massive puddle that had to be navigated. Only two guys passed me on the run, but neither were in my age group and I believe had started in a wave ahead of me so I already had at least three minutes on them. The second guy passed right before the finish and I should have held him off, but didn’t. All in all, it felt like a really solid race for me at the time and was confirmed when I looked at the results later and saw that I’d made the podium, getting third. Thanks to my wife, my coach Billy Edwards, my shop Foxtrot Wheel & Edge, my team Foxtrot Racing, sponsors GU Energy and Rudy Project, multisport shop Colorado Multisport, for all the support. I was pretty spent after the race as it was a fairly intense 75 minutes. The rain had let up and was done for the day. Most of the American delegation hung out at the finish line cheering on the rest of the competition whom I'd like to think was, at that point, pretty stoked to have anyone cheering for them, given the weather. At this point, we hadn't been given any indication that there wouldn't be any amateur awards and since Amy had won the female division, we packed up our gear and rode over to where the elite awards ceremony was to take place. We didn't have to wait long to witness history. The American National Anthem was played for Renee's win in the elite women's race. I have to believe that this was either the first time or certainly one of the very few times that song has been played on Cuban soil. Certainly since the revolution. I don't get goose bumps often, but man, I sure did then. 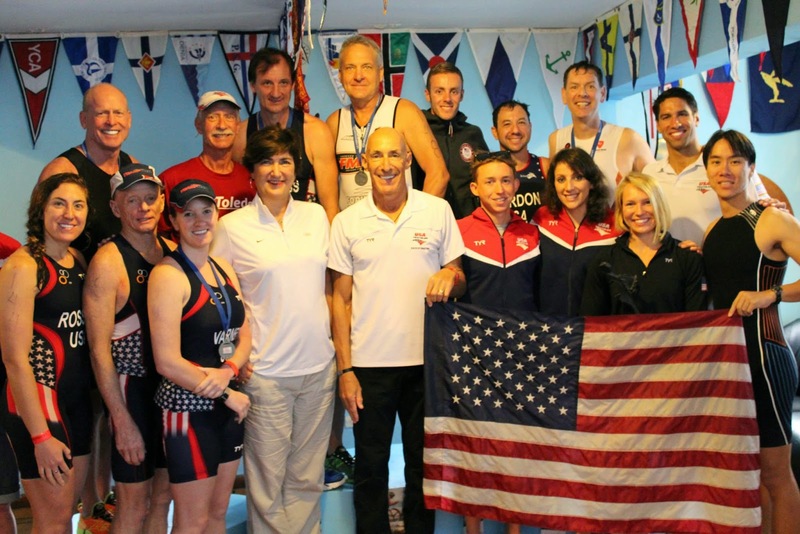 All the Americans who'd remained at the conclusion of the awards ceremony gathered for a group picture with the president of USAT, Barry Siff, and the president of the ITU, Marisol Casado. Now that the festivities and competitions were over, for us anyway, we could get on with being tourists (even though, legally, American tourism is not allowed in Cuba). Some of the group decided to take a cab back to their hotels, but a group of about eight of us decided to ride back - in our Team USA gear. It must have been quite a sight for the Cubans seeing us ride through the streets. We got horn blasts and thumbs ups from bus drivers and stares from pedestrians. One driver sped on ahead of us, stopped in the middle of the three-lane road we were on and took pictures before we rode by. With all the rain, the ride back was very wet and very dirty. We tried to capture just how dirty our legs were but the photo doesn't quite do it justice. We agreed to meet on a time for dinner and broke up to go get cleaned. I didn't even bother trying to ride back to my hotel this time, instead opting for a cab. 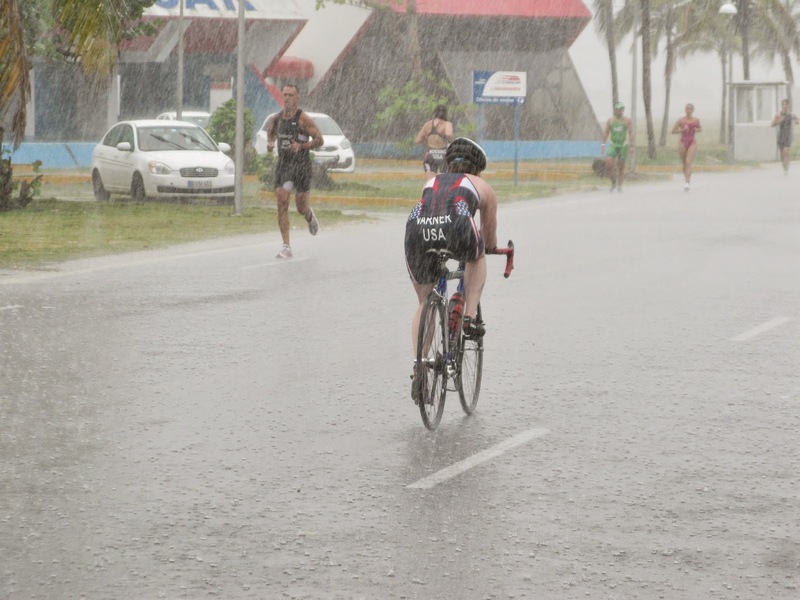 This was not Cuba's first time hosting a triathlon, but it was the first time hosting one so official as an ITU competition that was also a championship race. They still have a lot to learn. We used the same racks as the elites, but more were set up. We discovered shortly that they weren't actually stable, being held together by zip ties and duct tape. As more bikes were racked, the problem erupted with all the racks (and thus, bikes) falling down in domino fashion. 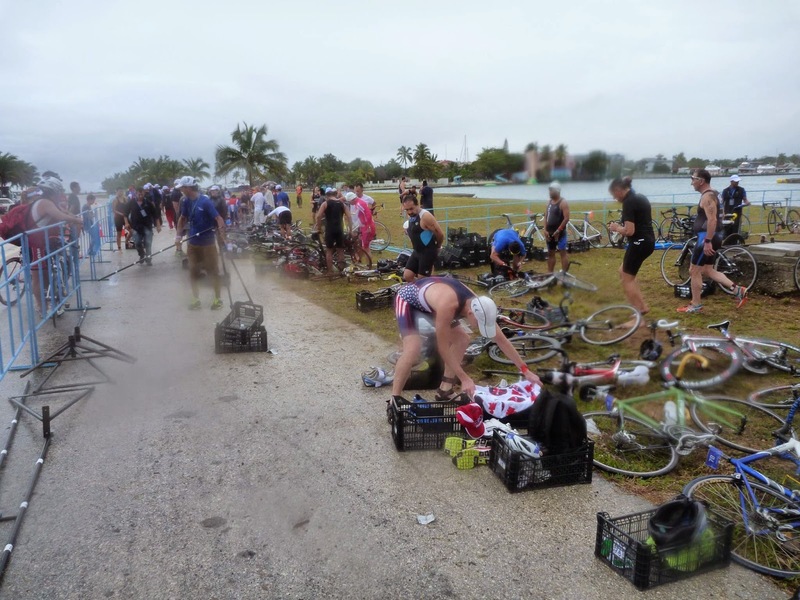 After a conversation between the ITU officials, it was decided that we would use the ground as our transition area which meant the bikes were lying down too. Because everyone and everything was so wet, body marking was impossible and was effectively nonexistent. We had timing chips, but in retrospect, I'm not sure what for as no age group results for the sprint were ever posted. I managed to get in a very brief warm-up swim near the water exit ramp. The swim lay in the closed end of the marina, the water level of which was not ground level, but rather a good two meter drop from the top of the retaining wall at ground level. We lined up on the wall before someone pointed out that it was probably not a good idea to have amateurs dive in and that having an in-water start was best. We all jumped in and treaded water next to the wall attempting to avoid the rocks, shellfish, and other sea life that dotted the bottom. Out of nowhere the horn blew and we were off. I tried to hang with the lead swim pack but after only 3 weeks back into training they eventually started pulling away. They were fast and I never found the fast feet that I normally do so my swim time wasn't my best. I managed to average 1:40/100m for the 750m. Out of the water and up the ramp there's another American right in front of me. I think he passed me in the last 100m of the swim. We are the first two Americans out of the water. Unused to the current transition situation of everything lying on the ground, I completely miss my bike, but not by too much. Not trusting the situation for leaving my shoes clipped in, I'd unclipped them and left them on the ground. I slap them on and proceed to mount too early. I'm used to a clearly marked and labeled mount line. Running a bit further, I find the correct mount line, mount a second time and headed out on the bike. The rain had stopped, but only temporarily. At some point during the first of four laps on the bike, the skies opened up again and didn't stop. I recall a Cuban kid riding up ahead but continuously looking back, like he was waiting for me to bridge the gap. We were told it was not a draft legal race and so I remember thinking this odd. He hops on my wheel and I just hammer on. Turns out, it was a draft legal race and so he got to recover in my draft while I, being so worried about a penalty, dropped back out of the draft zone every time he pulled ahead. We eventually overtake another rider somewhere from Central America, I don't remember where. He hops on our wheel and a little later I hear a yell from whom I think is the cuban and feel someone rubbing my back wheel. I turn and the second kid has pulled off to my right. I yell something about keeping his line and to pay attention. He takes off and I don't know if I scared or motivated him (or even if he finished), but I never saw him again. The Cuban kid clearly wanted to work together but I still didn't know it was a draft legal race so I did all the work and continued to drop back when he overtook. We ride our laps in the pouring rain through massive puddles praying no potholes lurk beneath the surface. I had a damn good bike for a January and only three weeks of training. My normalized power turned out to be 240 watts, only five shy of my 2014 peak. We come into T2 and I don't even bother with my socks as everything is just soaked. I start running and I feel my feet sliding around in my shoe. Not a great situation to be in when one is looking for stability. A few km into the run, an American passes me and I can't keep up. My Cuban biking buddy is long gone up the road. The rain continues to pour. A little while later, the lead female, also an American, passes me. I remember when my run used to be strong and vow that this year my run results will be different from 2014. 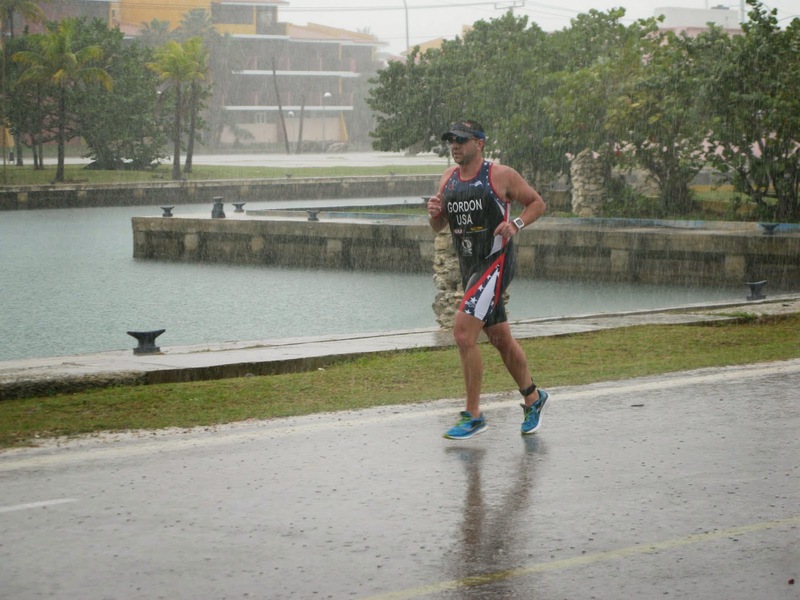 Three years off from racing and two knee surgeries did their job well. I stay mentally strong and gut out a finish. The run was long by nearly 500m but I'd managed a sub 8:00 pace. Not great, but for January, it was fine. Results were never posted so I have no idea on placing, but I was fairly close to the front.